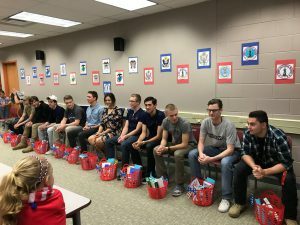 Conley Elementary students were thrilled May 25 to host 12 members of the Huntley High School Class of 2017 who are enlisting in the military. 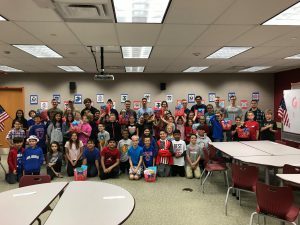 The Conley students both listened to their HHS counterparts talk about their decision to enlist and gave them care packages they had created earlier. The event was just one of many service projects completed by Conley 3rd and 4th grade classes this year. Students received weekly lessons that covered the Illinois Social Emotional Learning Standards. The final standard included contributing to the well being of one’s school and community. Each class discussed what community meant and how they could help the community. After each class had this discussion they brainstormed and then voted on a final project. 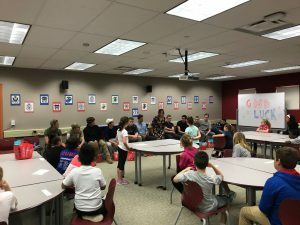 Each class chose a unique project, and the rest of the school joined one of those classes or did their own project as a Cool Tool through a PBIS lesson.